James Brooks and Charlotte Park lived together and worked in the Springs, playing major roles in the founding moment of abstract expressionism. James Brooks, one of the pioneers of American abstract expressionist painting, was born in St. Louis, Missouri, in 1906. He majored in art at Southern Methodist University from 1923-25, and moved to New York City in 1926, where he studied at the Grand Central Art School and the Art Students League. From 1938-42, under the auspices of the New York City WPA Federal Art Project, he painted murals in the Woodside Public Library in Queens, and the Marine Air Terminal at La Guardia Airport—the largest WPA mural in the nation, and one of the last to be completed under that program. Brooks served in the United States Army from 1942-45. He finished his military service at the Office of Strategic Services in Washington, DC, where he met his future wife, Charlotte Park. After the war, they moved to New York City. When Jackson Pollock and Lee Krasner, Brooks’ friends from the WPA days, were moving out of their apartment/studio on East 8th in, and married in 1947. They often visited Pollock and Krasner in East Hampton, and in 1948 they leased property in Montauk, including a cottage on the bluff and a building on the shore that they converted as a studio. After Hurricane Carol destroyed the studio in 1954, they bought land on Neck Path in Springs and moved their Montauk cottage there in 1957. Two years later Brooks built a new studio on the Springs property, where he continued to work until dementia ended his career. He died in 1992. 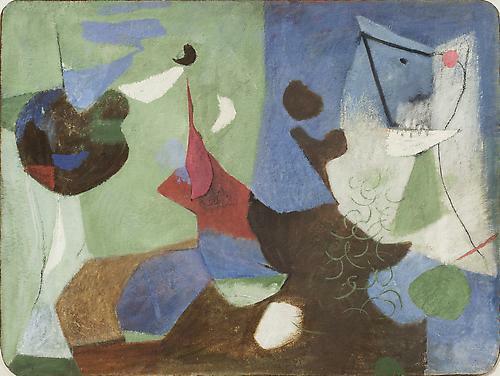 Like many of his contemporaries, including Pollock, Krasner, Philip Guston, and Mark Rothko, who began their careers as figurative painters, Brooks moved toward abstraction in the immediate postwar years, first using a Cubist-inspired formal vocabulary and soon developing a spontaneous, improvisational style. His major contribution was in pioneering a staining technique, using porous cloth that allowed paint to bleed through, creating forms on the back that he would use as points of departure. He described it as striving for “a new direction that will flower into some kind of new, imaginative thing.” Brooks had his first one-person exhibition of abstract expressionist paintings in 1949 at the Peridot Gallery in New York. Recognized as a leading member of the emerging New York School, he is at the center of Nina Leen’s famous photograph of “irascible” avant-garde artists—among them Pollock, Rothko, Willem de Kooning, Clyfford Still and Barnett Newman—that illustrated a 1951 Life magazine article. His work was included in numerous group exhibitions, and was the subject of a retrospective that opened at the Whitney Museum of American Art in 1963 and traveled to the Rose Art Museum, Brandeis University, Waltham, MA; Baltimore Museum of Art, Baltimore, MD; Walker Art Center, Minneapolis, MN; Washington Gallery of Contemporary Art, Washington, D.C.; and the University of California Art Galleries, Los Angeles, CA. Another retrospective was presented by the Portland Museum of Art, Portland, ME, in 1983. Brooks held teaching positions at Columbia University, Pratt Institute, Yale University School of Art, Queens College, and The Cooper Union. In 1963 he was an artist-in-residence at the American Academy in Rome, Italy. A winner of the Chicago Art Institute’s Logan Medal of the Arts, he was elected to the National Academy of Design as an Associate member in 1980, and became a full member 1985. Solo exhibitions of his work have been presented at the Dallas Museum of Art; The Brooklyn Museum of Art; the Hillwood Museum at Long Island University in Brookville, NY; the Heckscher Museum of Art in Huntington, NY;&nbsp;and Guild Hall Museum in East Hampton, NY. He is represented in many museum collections, including those of the Museum of Modern Art, NY; Solomon R. Guggenheim Museum, NY; Metropolitan Museum of&nbsp;Art, NY; Smithsonian American Art Museum, Washington, D.C.; Brooklyn Museum; Corcoran Gallery of&nbsp;Art, Washington, D.C.; Dallas Museum of Art, Dallas, TX; Carnegie Institute, Pittsburgh, PA; Walker Art&nbsp;Center, Minneapolis, MN; Whitney Museum of American Art, New York; and Yale University Art Gallery,&nbsp;New Haven, CT; Courtauld Institute, London; Tate Modern, London. His estate is represented by Van Doren Waxter Gallery, New York. Charlotte Park, whose significant contribution to the emergence of abstract expressionism in the 1950s has only recently received full recognition, was born in Concord, Massachusetts in 1918. From 1935 to 1939 she studied at the Yale School of Fine Art in New Haven, Connecticut. During World War II she worked for the Office of Strategic Services in Washington, DC, where she met her future husband, James Brooks. She moved with him to New York City in 1945 and studied privately with Australian artist Wallace Harrison, who also became a mentor to Brooks. 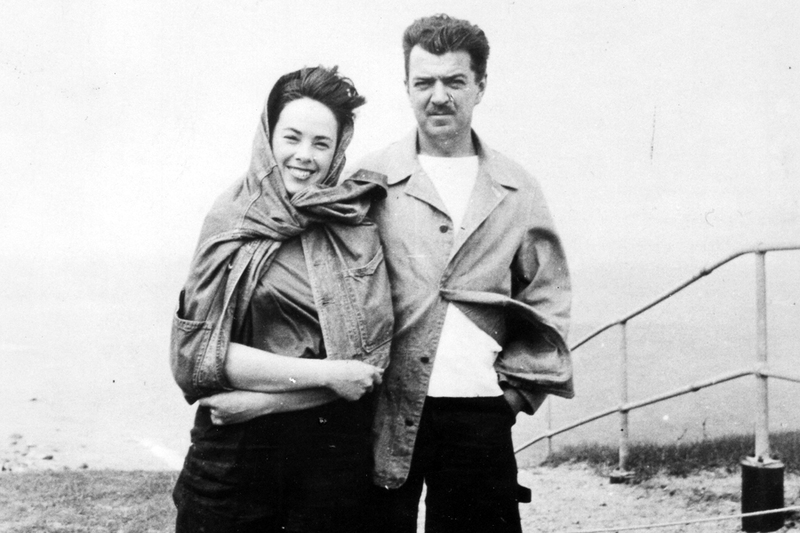 After visiting their friends Jackson Pollock and Lee Krasner in East Hampton, Brooks and Park soon found a home and studio of their own in Montauk. After their studio was destroyed by a hurricane in 1954, they moved their cottage to Springs, where it became their full-time residence. Park died there in 2010. Although Park started as a proponent of Cubism, by the 1950s she had developed a more lyrical idiom, suggesting the organic contours of natural forms, coupled with a bold color palette. Throughout the 1950s she exhibited regularly at the prominent Stable Gallery in New York, and was included in the Whitney Museum of American Art Annual Exhibition of 1953. She taught at the Dalton School in New York City in 1951, and at the Museum of Modern Art, New York from 1955-57. Her first solo exhibition was held at the Tanager Gallery in 1957. Notwithstanding her recognition as a first-generation member of the abstract expressionist movement, in the 1960s Park withdrew from the art world, emerging again in 1973 with a solo exhibition at the Elaine Benson Gallery in Bridgehampton, NY. For the next twenty years her work was included in numerous group exhibitions on Long Island and in New York City, as well as “Seventeen Abstract Artists of East Hampton: The Pollock Years, 1946-1956,” at the American Cultural Center of the United States Embassy in Paris in 1979, which traveled to the Zabriskie Gallery, New York, in 1980, and to the William Benton Museum of Art, Storrs, CT, and the Parrish Art Museum, Southampton, NY, in 1981. In 1979, Guild Hall Museum in East Hampton held a solo exhibition of Park’s paintings from the 1970s, which were also shown in 1980 at the Ingber Gallery in Manhattan. The following year the Louise Himelfarb Gallery in Water Mill, NY presented a two-person show of recent work by Park and Brooks. In 2003 the Parrish Art Museum hosted “Three East End Artists,” featuring Park alongside Dan Christensen and Allan Wexler as three influential artists who have lived and worked on eastern Long Island. The renewed interest in her work in the 21st century has led to solo exhibitions at the Spanierman Gallery in East Hampton, Spanierman Modern in New York City, and most recently at the Pollock-Krasner House and Study Center in East Hampton. Examples of Park’s work are in the collections of the Parrish Art Museum, Water Mill, NY; Guild Hall Museum, East Hampton, NY; Corcoran Gallery of Art, Washington, DC; and the Telfair Museum of Art, Savannah, GA, as well as numerous private collections. Her estate is represented by Spanierman Modern, New York.